Here is a great idea for a fun summertime activity (for all ages! ), and it makes a delicious treat too so it's a double bonus! I remember the first time I made homemade taffy, I thought it was so cool to play with my food with permission before eating it. This will provide a good activity for kids with the summertime boredom bug, it's also a great summertime birthday party idea! My birthday is in August, as is my son's birthday (one year old already! ), and my brother, my sister, my sister-in-law, and my father-in-law all share this month for birthdays - sounds I will be making a batch of this taffy for one big party blowout! This recipe is fun since you can change the flavor to whatever you want, just by using a different flavor of Kool-Aid. I really liked the fruit punch flavor, or cherry is good too. This is really fun to kids, but be sure to have a lot of butter around to butter up your hands as you pull so that it doesn't turn to a sticky mess. The taffy can be stored for a few days (if cut in individual pieces and wrapped in waxed paper) before it will be really hard. I recommend eating it the same day, and if you are like I am around taffy-that's about all it would last anyway! 2. In a medium saucepan, stir together the sugar and cornstarch. Add corn syrup, water, butter and salt and stir well until butter is melted. 3. Bring to a boil over medium heat and stop stirring. Cook mixture until candy thermometer read 250 degrees F (120 degrees C). This takes some time to get it to 250 degrees. Once it approaches 250 degrees watch very closely because it cooks quickly at the end. 4. Immediately remove from heat. (If you cook it too long it will turn out very hard.) Carefully stir in vanilla and drink mix. Stir well. 6. Butter hands and begin pulling, as many time as it takes to become opaque and lighten in color, usually about 15 minutes of pulling. You will probably need to butter your hands a few times. 7. Pull into long rops and cut into bite sized pieces with buttered scissors or a buttered pizza cutter. 8. 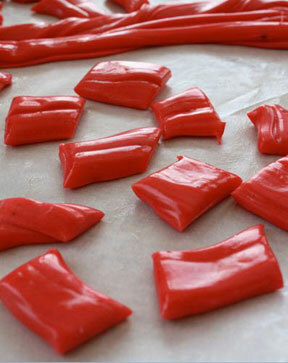 Wrap the pieces of taffy in squares of waxed paper and make sure to twist the ends really well to seal. 9. Store in an airtight container in a cool dry place.